So...I've had pot on my mind a lot lately. Why is that, you ask? Well, my neighbor has been smoking pot every night. Sometimes two times a night. The smell comes into my apartment through the bathroom. Maybe my neighbor is psychic. Because today, I saw "pot-ready thin spaghetti" on sale at CVS. What be this newfangled pasta invention? OK, so it's basically just thin spaghetti cut in half. You just add water to your pot and boil it for a while. Then the pasta soaks up all the water so you don't have to drain it. Cooking it this way even helps make the base for a lovely pan sauce. When I looked online to see if everyone else has been experiencing this awesomeness, I found a message board where people were actually complaining about its existence! These fancy foodies claimed that you could just break your spaghetti in half (true, I suppose) and that it was an indication of the sad, desperate level of laziness for the common man. Maybe something's wrong with me, but I'm personally fascinated by this simple concept! I hate draining pasta! And it even saves water. Plus, cooking the pasta this way lends itself to recipes that go the pasta route or the lo mein route. 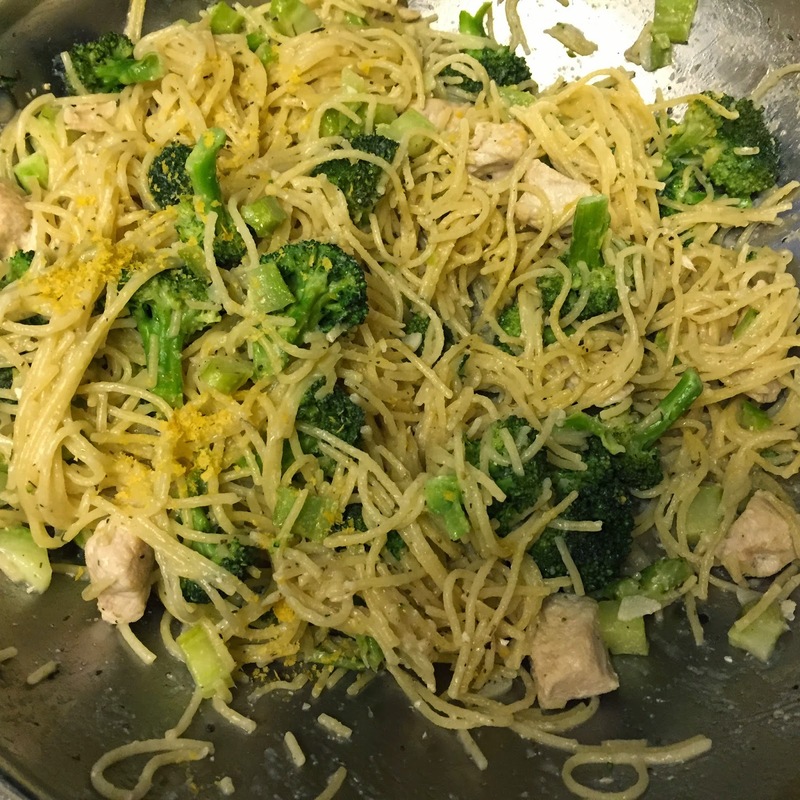 Add chicken and broccoli and you have a nice weeknight dinner. 1 pot, a bajillion possibilities! Heat a large deep skillet or wok (something with a lid) over medium heat. Cook the chicken breast in olive oil until browned. Remove from pan & set aside. Stir fry the broccoli with olive oil in the pan for about 5 minutes and remove from pan & set aside. Turn the heat up to medium-high. Add a drizzle of olive oil, the garlic, spaghetti & water to the skillet/wok and cover. Bring to a boil, and turn the heat down to medium. Let cook for about 8-10 minutes until the water has evaporated and the pasta is al dente. Add the chicken and broccoli back into the pan. Squeeze the lemon over the pasta and stir. Season with Italian seasoning and salt, and sprinkle with nutritional yeast or Parmesan cheese for a bit of extra oomph. Proceed to carbo load as if you're going to run a marathon tomorrow.